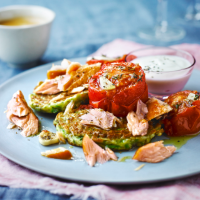 These bright, minty fritters are lovely eaten simply with a dollop of yogurt, but taste even better when topped with quick-roast tomatoes and hot smoked salmon. 1. Preheat the oven to 200˚C, gas mark 6. Put the tomatoes, cut-side up, on a parchment-lined baking sheet. Scatter over the thyme leaves, garlic and sugar; season. Drizzle over the olive oil and roast for 20-25 minutes, until softened and beginning to char; set aside. 2. After 10 minutes, start making the fritters. Put the peas in a large bowl and crush them with a potato masher, then stir in the salad onions and mint; season. Stir in the flour and baking powder, followed by the egg and milk, beating to a smooth, thick batter. 3. Heat the vegetable oil in a large, non-stick frying pan set over a high heat. Spoon in the batter to make 4 even fritters. Cook over a medium-high heat for 2 minutes on each side, until golden. Serve with the kiln roasted salmon, roast tomatoes and yogurt.